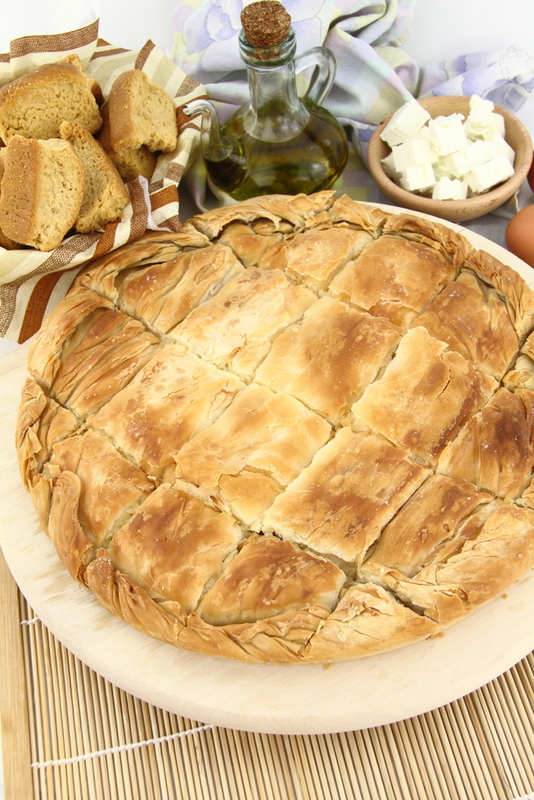 In case you’re in Greece and you want to taste some, you’ll ask for “prassópita”. And, by the way: Don’t forget that pies are our favorite street food! Heat some olive oil in a frying pan. Add leek and onion and sauté for about 8 minutes until both are soft and tender. In a large bowl slightly beat the eggs. Add feta, yoghurt, dill and sautéed leek and onion. Mix and add salt and pepper. Grease an oven pan with some olive oil. Place half the phyllo sheets by brushing them one by one with olive oil. Spread the filling mixture evenly over the phyllo sheets. Cover with the rest of the sheets by brushing them one by one with olive oil. Gather any overhanging phyllo and fold so as to cover the filling. Brush the edges with olive oil as well as the top of the pie. Bake in a preheated oven for about one hour or until golden brown.